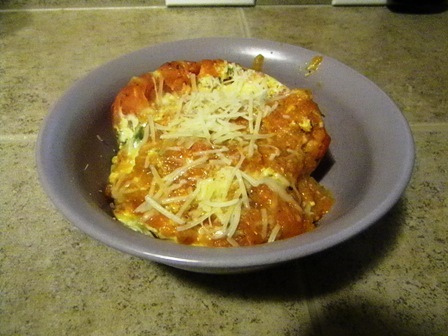 I was kind of in the mood for having stuffed shells. Since I can’t actually have pasta shells I was trying to thinking of a good substitute. I figured tomatoes might work. As I got to work I really thought my meal was going to turn out to be a disaster. It turns out hollowing out tomatoes is not all that easy. My tomatoes split causing the filling to run out a little, and it was all a little messy. I felt a little better when the pasta shells I was using for my husband also ripped, so it wasn’t just because I was using tomatoes. In the end everything turned out fine. In a blender combine dry curd, eggs, melted butter, and water. Blend until smooth. Pour mixture into a bowl. Stir in 1 cup parmesan and the grated provolone, spinach, and the spices. Hollow out the tomatoes – cut off the tops and carefully squeeze just enough to get rid of most of the seeds and the liquid. Then gently scoop out as much of the flesh as possible to just leave the outer shell. Spread a cup of the sauce on the bottom of a glass baking dish – whatever size will hold the tomatoes. Place tomatoes in the dish. Pour cheese mixture into the tomatoes. Pour rest of sauce over tomatoes and top with the rest of the Parmesan and the slices of Provolone. Bake for 30 – 35 minutes until cheese is melted and bubbly.